A lone sailboat floats beneath a shimmering sunset as some seagulls fly overhead. A lonely island stands tall just beyond the waves. The glow of the sun casts countless sparkles of color through the bright water. Enjoy the marvelous colors while they last, as no sunset lasts forever. And no sky is the same. **This coastal wall art was painted using oil paints. It was created on high quality cotton canvas and is stretched and ready to hang. The sides of the oil painting are painted *black* to give the art a professional look. You can hang it right out of the box! 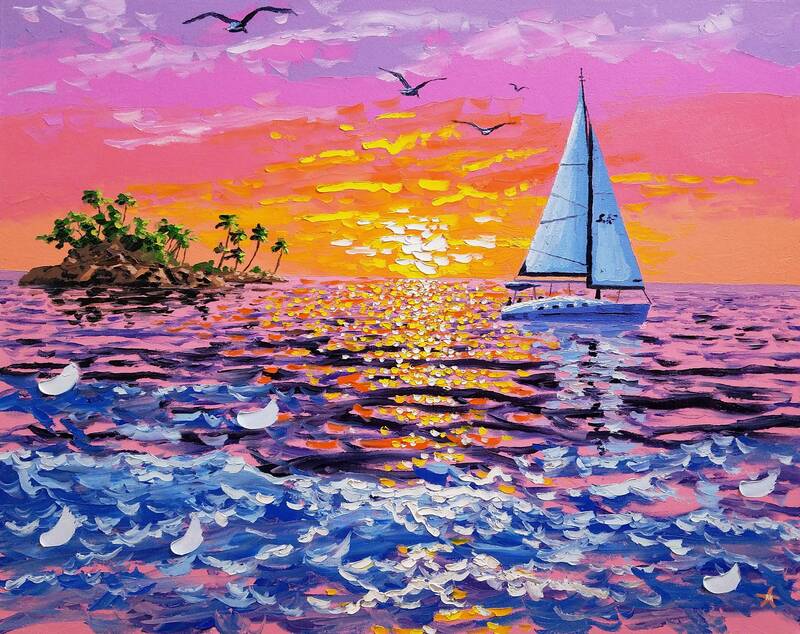 **This sailboat painting is 24 by 30 inches in size and comes with a certificate of authenticity, signed by me. The colors and rich textures of the painting make the work pop off the canvas. My 3-D style is very exciting and makes my art unique.